Rare is a studio that's known for putting out multiple classics on Nintendo's older hardware. Though the studio is arguably best known for its Nintendo 64 games and its work on the Donkey Kong series, it also put out Battletoads way back on the NES. Known for being a great example of 'Nintendo Hard' gameplay – especially with that hoverbike sequence – the beat 'em up has something of a cult following in current times. What do you think? Did you ever beat Battletoads? What did you think was the hardest game on the NES? Share your thoughts in the comments below. Battletoads always was a great series of games. It's too bad now M$ owns the rights and apparently the original art designers aren't at the helm. Saw the new design for the characters on the Rare Replay box art and all I will say is they should have just stuck with the original character art. David Wise is a Legend. I don't think I had ever actually listened to him speak before, come to think of it. And now he's composing Yokalayee!!!!! 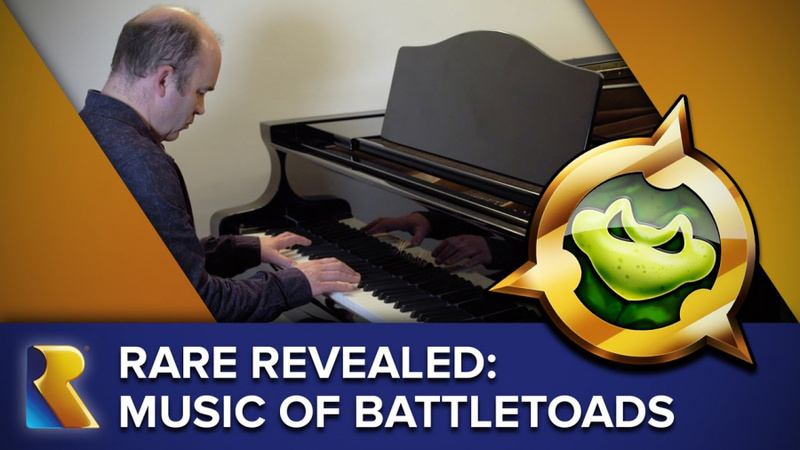 I love the music of the Battletoads arcade game. One of my favorite games on Rare Replay. Still waiting on a new Battletoad game. @shonenjump86 The only thing happening with Battletoads now is Rash coming to Season 3 of Killer Instinct on Xbox One this year at some time. That game truly had some nightmare level difficulty but I do love the game. Still play it on my nes from time to time. Yeah, I tried him out on KI when they had him for a test run not to long ago. I'm looking forward to him in season 3 of KI. Did Anyone ever beat Battletoads? Well okay someone must have but still, I love Battletoads, get it back Rare or Playtonic or whoever and bring it back! They're amazingly fun games, even if alot of people never saw most of it. David Wise is such a legendary composer too. @Tempestryke I've beaten it, though I've lost my skill now so I need to practice more so I can beat it again. Like anything it really just takes practice. You play the levels and die enough and eventually you learn how to beat them. That's cool though. I'd love to see what the rest of the levels past Turbo Tunnel look like. @Tempestryke they ran it at agdq. And just to make you feel bad they did the turbo tunnel blindfolded. It was an amazing game, ahead of its time. Never beat it, the farthest I got was level 11 I think, the one where you were riding on some kind of bike being chased by a ball, with arrows on the floor. I've never played Battletoads, but I'd love to do so if it ever comes to VC! I've heard so much about its difficulty, I want to see for myself. I have just about every version of Battletoads ever made. These games did indeed push the limits of their respected systems, and will always hold a special place in my heart. Battletoads was one of my favorite NES games (possibly my favorite, no wonder since I use it as my avatar). I got to the tower, I think it's the last level, but I never had enough lives left to beat it. I wish I had never gotten rid of my NES way back when and could still play this game. It's such a shame this will probably never come to the virtual console. I don't recall ever beating "Battletoads", even with the Game Genie...though I think one of my childhood friends did. Visually, I was much more impressed with the arcade game, but the difficulty level on both is nuts. One small question: Is this David Wise the same one as the one who did the TMNT 1987 series music? That's probably why its so awesome! !